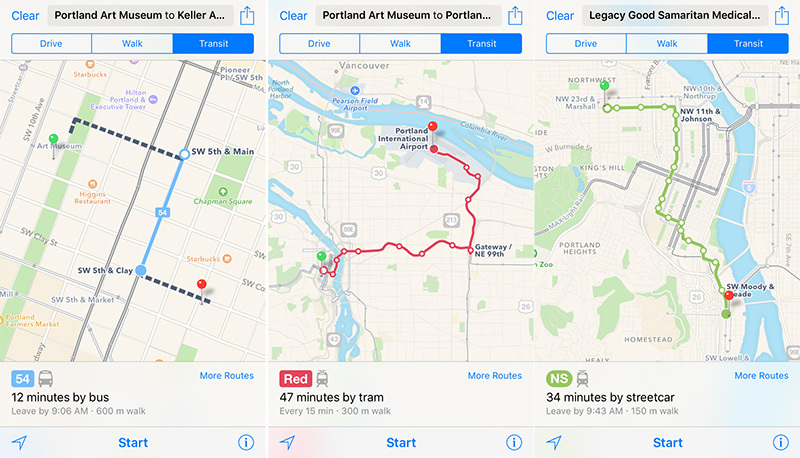 Apple Maps has been updated with all-new transit data in Portland, providing users with aerial tram, bus, MAX light rail, WES commuter rail, and downtown streetcar routing in Oregon's most populous city and the surrounding metropolitan area. The public transit information is supplied by the city and regional transportation agency TriMet. Apple Maps transit routing and trip planning is available throughout most of Greater Portland, including connections with the suburbs of Beaverton, Gresham, Hillsboro, Lake Oswego, Milwaukie, Oregon City, Sherwood, Tigard, Tualatin, West Linn, and smaller communities, along with the nearby city of Vancouver, Washington. 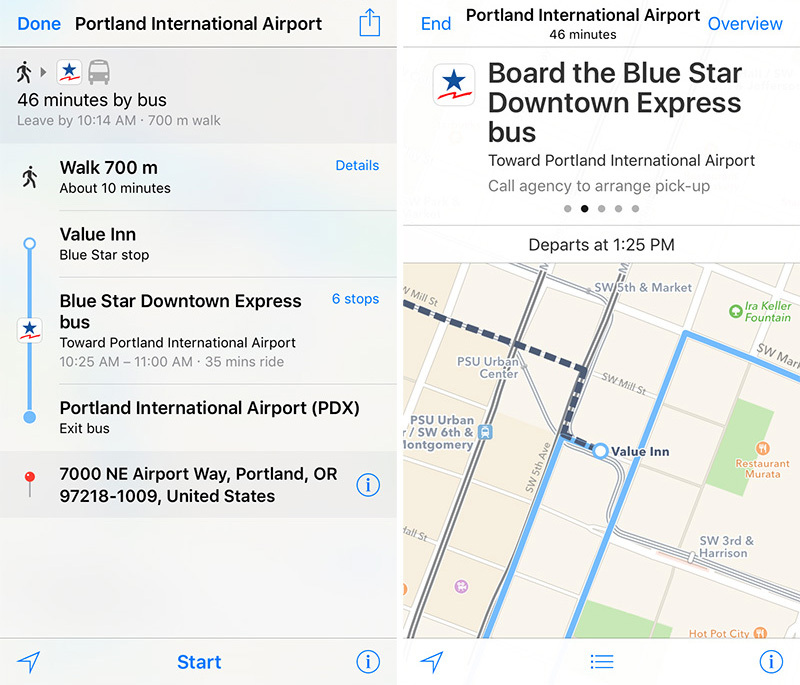 Portland is the latest North American city to support Apple Maps transit after Austin and Montreal. Other regions with Apple Maps transit directions include Baltimore, Berlin, Boston, Chicago, London, Los Angeles, Mexico City, New York City, Philadelphia, San Francisco, Sydney, Toronto, and 30 cities in China. Transit mode was added to Apple Maps as one of the headline features of iOS 9 last year. If they add cities this slowly it will take forever to have transit available globally, there are only 14 cities right now with Apple transit data plus China, but Apple does not say how many in China. Sure, I agree but the pace is just way to slow. Part of the issue seems to be that Apple wants to cherry-pick cities. Google allows any transit provider to submit data (I work for one) but Apple apparently has zero interest in getting NZ in there. Sure, I agree but the pace is just way too slow. Luckily Google Maps works perfectly well on my iOS device - if they would provide a toggle to select an alternate Maps app as the default, we'd be golden. Apple needs to remember that they are a hardware company - make only as much software as is necessary to sell the hardware. In this case, Maps might be a hedge to ensure access to a navigation app (should others stop supporting iOS). Correct me if im wrong but I believe Montreal was also just added last week, I got a notification on all my devices saying transit routes were now available in Montreal. Depends on the criteria used to define better. If the criteria is profit margin, market share, brand recognition, and ROI then Beats made sense. That just the headphones, and doesn't even take Beats Music into consideration. When you look at Waze, Spotify, and Beats, only one of those has immediate and tangible contribution to the bottom line. Beats reputation in certain circles is a different animal, and means nothing in a financial sense. Waze and Spotify would probably contribute more to the infrastructure of Apple's services. It's not monetary, but solidifying Apple's services does have value. Services isn't Apple's strong suit and any bolstering there is a plus. Using that criteria, those two could be considered a better acquisition. Just depends on how you want to measure better. Agreed, I meant the latter. Also, I'd argue that bolstering the iPhone UX (especially in critical areas such as maps and music) is more important to Apple's long-term financial health than whatever contribution beats' headphone business could add to Apple's bottom line. Yes!! That one student Apple hired to enter transit data into Maps is really paying off: 11 cities done, 49.989 to go. Google maps didn't become great overnight. Apple needs to do it correctly.